Originally Posted on July 16th, 2011 on the original Media Machine website. It was a humid night in Alabama on July 14th, but the people waiting in line outside their local movie theater probably did not notice. To them it was not just a regular midnight showing. It was the midnight showing of the last film in the Harry Potter series. It was probably the last time most of them would have an excuse to put on a cape and draw a scar on their forehead. Well, unless it is Halloween. That is probably not as fun though. I mean how many times do see someone ride through a movie theatre parking lot blaring the theme song to Harry Potter, and it would be cool. People laughed, some yelled, but I do not think anyone thought those people were weird or nerdy. I mean why would they being is the majority of the people there were dressed up as their favorite character? This is one of the very few reviews that I am okay with not giving you a detailed summary on what happens in the film. I assume that almost all of you who are taking the time to read this already know what happened or you don’t care. But, just in case, here is what happens. 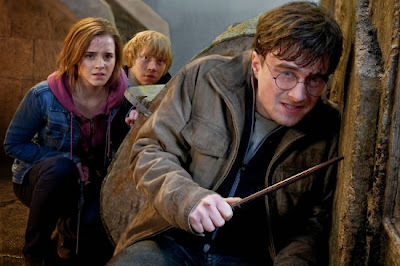 Harry, Ron, and Hermione return to Hogwarts to find the last remaining Horcruxes. While they are there, the Battle of Hogwarts breaks out. And, that goes on for most of the film. If you have a problem with that summary just go see it. Okay, now to my favorite part. One of the main things I loved about Harry Potter and the Deathly Hallows – Part 2 was that we got to see all of our favorite characters (and actors) for just one last time. Some did not get as much screen time as some like Jim Broadbent as Horace Slughorn or Emma Thompson as Sybill Trelawney, but when they are on screen they shine. I think everyone almost gets their moment in Deathly Hallows – Part 2. Molly Weasley (Julie Walters) gets to duel with Bellatrix Lestrange (Helena Bonham-Carter), Remus Lupin (David Thewlis) gets some very important scenes, and then my two favorites were with Severus Snape (Alan Rickman) and Professor McGonagall (Maggie Smith). I will go-ahead and admit it, Snape was one of my favorite characters during the entire series. Rickman is just a master of dialogue when it comes to playing Severus Snape. He stole every scene he was in. Smith was just excellent as Professor McGonagall. It makes me wonder why didn’t she get a few more scenes in the past few films, but that is all in the past now. To me, Rickman and Smith were probably the big standouts when it comes to the older actors. I have said this time and time again, but I predict that Daniel Radcliffe, Rupert Grint, Emma Watson, and Tom Felton will have successful careers. In this film, all four of them show that these characters are theirs, and no one else can play them. They show how these characters have matured, and how they have matured as actors. I mean are they an Alan Rickman or Maggie Smith? No, they aren’t. Well, not yet, I think once these four actors get into future films, or in Radcliffe’s case plays and films, they will show that they are not some one-trick ponies. Now, will they be associated with this series for the rest of their career? Probably. But, other famous actors have shown that you can shed that image of being tied to a certain character. Johnny Depp did it after he left 21 Jump Street, Tom Hanks did it after Bosom Buddies was cancelled, and George Clooney did it after he left E.R. Then you have some actors who will always be associated with a character like how Sean Connery was with James Bond, or how Harrison Ford is with Han Solo and Indiana Jones. However, they still had very successful careers even though they were always seen as those characters. The way it seems to me these actors are fine with being associated with these roles. I think they know that if it were not for these films they would not be where they are today. Now to the part most of you probably do not care about, and that is the technical side of this review. David Yates does a phenomenal job at directing this final chapter. The flow of the film is great and Yates is the one responsible for that. I kept hearing him say before this film was released that Part 2 was going to be extremely different from Part 1. Yates kept saying it would be a “big opera with huge battles.” Once I saw the film I knew exactly what he meant. Part 1 was gritty and realistic, while this one was a true fantasy film. Also, Alexandre Desplat’s score made this film very operatic. I did not hear as much of John Williams’ classic “Hedwig’s Theme” as I would have liked. The sets were unbelievable, as were the visual effects and cinematography. I can almost guarantee that Harry Potter and the Deathly Hallows – Part 2 will earn some Oscar nominations in those categories. At around 11:00 p.m. on July 14th, 2011, those people in Alabama, who were waiting outside, are now making their way to their seats. That is when the countdown really started. A random guy would yell in my theatre “One hour left! !” We would all scream and then the noise would die down. Thirty minutes later the same guy stood up and shouted, “Thirty minutes ‘til Potter! !” Again, everybody shouted, but this time a little bit louder. Finally, the previews started. People laughed at certain films, they booed when Breaking Dawn: Part 1 came on, and they were quietly paying attention when The Dark Knight Rises came on. Then the music started up, the Warner Bros. logo came on screen, and the people began to cheer and applaud before they saw a single scene. It was the last time they would see a new Harry Potter film. To me it brought back memories to when I saw the first film ten years ago at the now closed-down Fox 12 Theatres. So much has changed since that November of 2001. To me it was the last chapter in a film series that I had followed for ten years. However, to most people there that night, and all around the world, it was the closing chapter to not just a ten-year film series, but it was the end of a fifteen-year journey that started back in 1997 when J.K. Rowling released the first novel in the United Kingdom. To every traveler on that journey, including myself, “It All Ends” was not just a tagline created to help promote a film. It was a little something more.